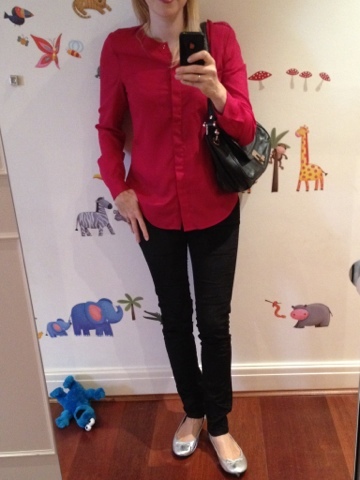 It’s another shoe dilemma for me, wearing or should that be finding pointed shoes that do not elongate my feet. A chance detour pounding to work yesterday in LK Bennett Shilo’s (I’d left my ballet flats at home by accident) took me to Jones Bootmaker. 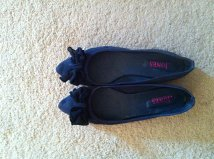 It’s usually hit or miss for me in there but once I spied the Navy blue suede Gloriana pointed ballerinas in a 42, no less, I had to try them. “Do they make my feet look big?” I asked the Assistant. “Well, er, no, not really” came the reply. “Do they make my feet look longer than normal?” was my second question and attempt at self-convincing. “No, but they are a pointed pump, with a little heel, AND the bow distracts from the length”. She had obviously been reading my mind or Grazia. I could tell she was fed up. She softened. “In fact, they are the last pair in 42. We are waiting for more stock from the Warehouse”. “Oh right” I said as I turned back and forth looking at my feet in the very small mirror at the back of the shop. It was hot. “Why don’t you just get them?, they fit, they look good on your slender feet and they are comfortable” she sighed. This entry was posted in Jones the Bootmaker, LK Bennett on July 24, 2012 by Mon WornOut.